Unlike the World Health Organisation, I am a rather a fan of sausages. I tend towards an “everything in moderation” approach when it comes to food, rather than WHO’s highly entertaining categorisation of sausages alongside plutonium due to their cancer risks. (Obviously it must be true, I read it on the BBC website here). Whoever does the PR for British Sausage Week this week must have been banging their head against their desk when the WHO dropped their anti-sausage stats a few days beforehand. Fun and games. Anyway, if others are spurning sausages it means all the more for me, and if they’re really lucky, my family too. 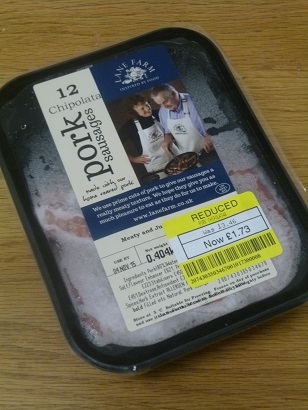 I do have reservations about value range sausages, which might have as little as 37% meat, so instead I pick up occasional packets of fancy chipolatas from the local Co-op if I spot them in the reduced section. The sausages can then be hoarded in the freezer until the kind of dismal November day that is calling out for comfort food. that may even have met an actual pig. So today I whipped some sausages out of the freezer to defrost, and got cracking with recipes to stretch a single packet across a family of four. Staring at three small sausages each marooned in the middle of plate would be rather depressing. Instead, my approach is to make mini toad in the hole for the children, and a sausage casserole with jacket potatoes for my husband and me, accompanied by whatever veg we happen to have handy. It just requires mixing together 80g plain flour, 2 beaten eggs and gradually adding 275ml milk, plus a touch of salt. This makes enough mixture to use in a 12 hole bun tray. The real secret is to use a little knob of lard in the bottom of each of the holes in the bun tray, and make sure the tray goes in a ferociously hot oven for at least 5 minutes, so the fat gets really hot. The oven needs to be at least 220 degrees C / Gas Mark 7. Then whip the tray out, pour in the batter to about half way up each of the holes, add half a sausage to each and get it back in the oven asap. 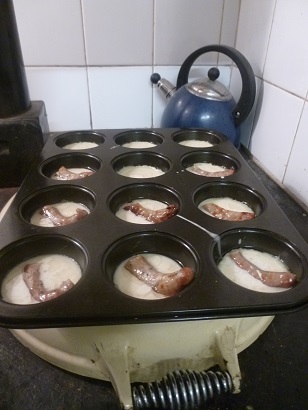 I only added sausages to 8 of the 12 holes, as my daughter requested some plain Yorkshire puddings alongside the mini toad in a hole versions. 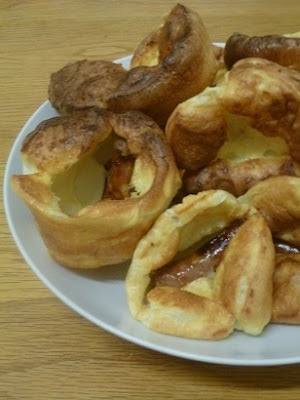 After about 15 minutes you should have some lovely puffed up mini toad in the holes, ready to whisk to the table and serve quickly before anything can collapse. I added some boiled carrot sticks and gravy to make a meal suitable for a November evening, and tried to resist the temptation to snaffle too many myself. I think this harks back to fond family memories of the elegantly named “Sausage Thing” that my mother used to make. The main idea is to stretch out a few sausages with tomatoes, vegetables and a tin of baked beans for extra protein, all simmered together into a rich casserole. It involves chopping an onion, crushing a clove of garlic, grating a chunky carrot and softening the whole lot in a couple of teaspoons of oil in the bottom of a saucepan. After 5 or 10 minutes, chuck in a tin of chopped tomatoes, a tin of baked beans and the remaining sausages chopped in chunks. If you have any mushrooms handy, they would be great sliced and added. I didn’t, so I couldn’t. Pour in about 200ml of fluid, whether stock made with a beef stock cube, or some red wine. Adding some paprika or even caraway would be great too. Then just let it hubble bubble away on top of the hob while you wander off and do other things, cook the baked potatoes, hustle the children into pyjamas, watch some fireworks or whatever else. Give it a stir from time to time, and top it up with extra stock, wine or water if it’s looking a bit dry. I usually let it simmer away for 40 minutes to an hour or so. When you’re ready to eat, rustle up some veg and serve the sausage casserole with whatever combination of jacket potatoes, mash, rice or crusty bread that you prefer. 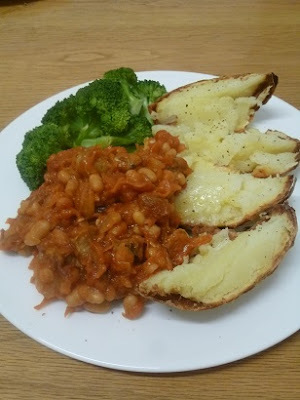 Sausage casserole with a jacket potato and broccoli: bonfire night on a plate. In theory, these quantities should feed two people plus an extra portion left for a packed lunch the next day, but this only works if you have any degree of self control. Anyone else have favourite recipes with sausages? I make a similar sausage casserole; I like the fact it's so versatile. Yes I reckon that applies to a lot of my cooking – doesn't always look very pretty but it tastes good, as the photos I take tend to remind me!